One of my final cities that I decided to visit during my 10 day adventure through The Netherlands was Maastricht. 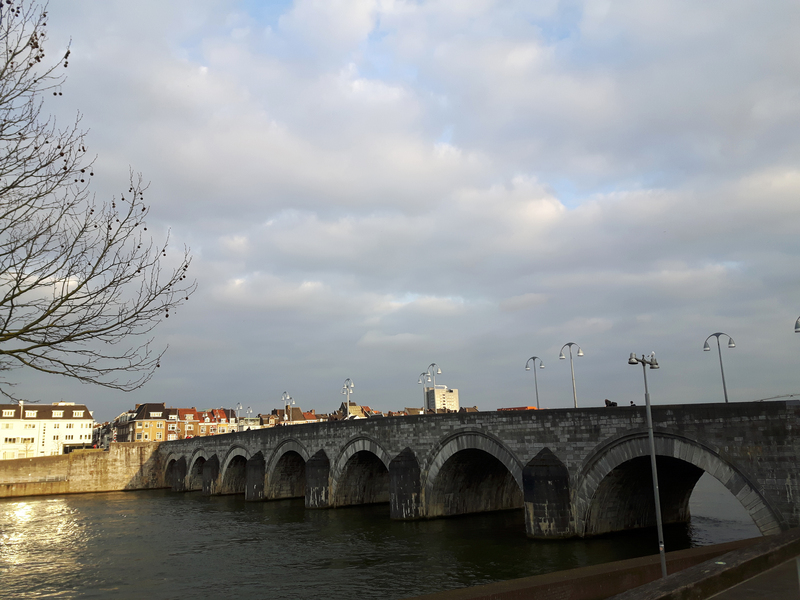 As the southernmost city within the country, Maastricht seems a world away from the typical Dutch scenes you’d likely see in other parts of The Netherlands. The train ride took me through a more hilly landscape and the city itself is brushed with a slight German/French/Belgium touch within the architecture, food and even the language. Maastricht is located very close to the German and Belgium borders, thus making Maastricht one of the more diverse cities in The Netherlands. 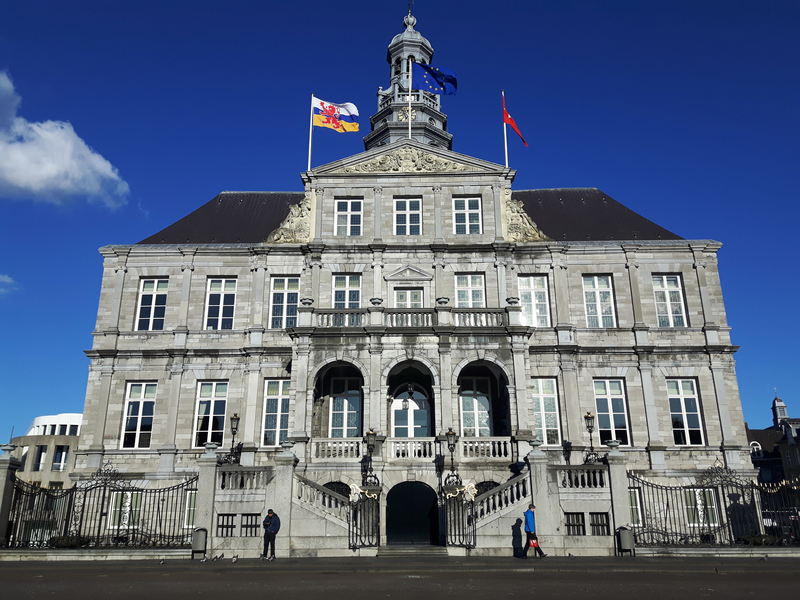 The Maastricht Treaty was also formed here back in December of 1991, then signed in February of 1992, making Maastricht the birthplace of the (E.U.) European Union. 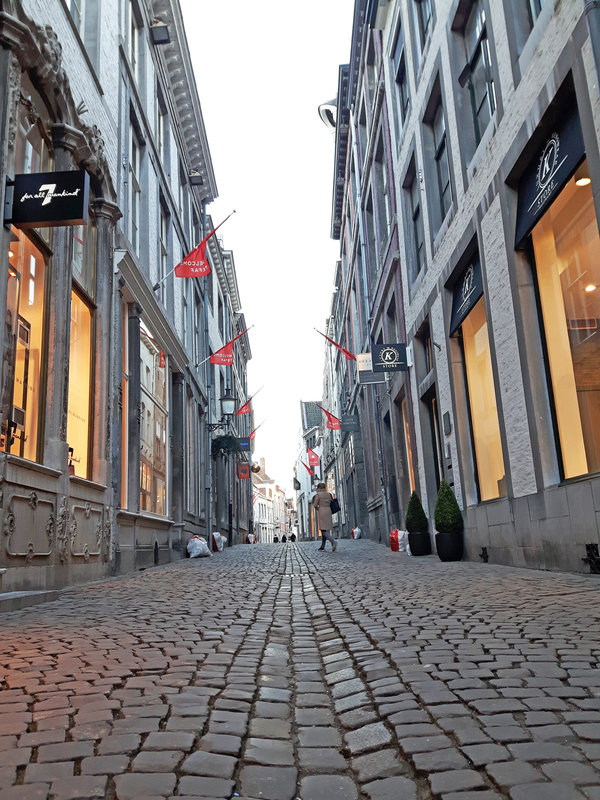 A city that is steeped in history, filled with quaint alleys, great shops and a bustling main square, Maastricht is definitely a city to visit and very easily enjoyed. That being said, I DID run into a fairly off putting experience my first night in the city. I had decided to go for a walk at night, around 8pm, so nothing too crazy, as I normally would before turning in for the evening. As I made my way into the Old Town area, I noticed a man watching me incessantly from the corner of my eye. I started to walk away and because I familiarized myself with the streets during the day, I tried to lose him, but to my shock, it didn’t work. He was still following me. As I began to walk faster, so did he. I took a right turn, so did he. It got to the point where I started to get scared, which normally doesn’t happen to me when travelling solo. This was a first time. I was frantically walking towards people, shops, or anything that seemed open still. I could feel him walking so close to me that if I were to come to a halt, he would’ve bumped directly into me. I was then prepared to be robbed, mugged, or worse. My mind was spinning. I then saw a restaurant with three girls closing up and I walked directly towards them and yelled, “Hey, guys,” as if I had known them. I walked in and told them what was happening and they took me in until the coast was clear. One of the girls looked down the alley and said he was standing on the side of the building waiting for me. UGH! I guess he caught on that we were on to him and he shrugged his shoulders and yelled, “WHAT?” He then took off and one of the girls offered for her and her boyfriend to drive me to my hotel. Thankfully they were there to help me because I was literally scared shitless at that point and shaking. THAT was the only thing that left a bad taste in my mouth during my visit to Maastricht. Other than that episode, the city was charming, the people were lovely and the streets were fun to wander around. BUT on to a more positive note regarding this eclectic Southern Dutch gem of a city. 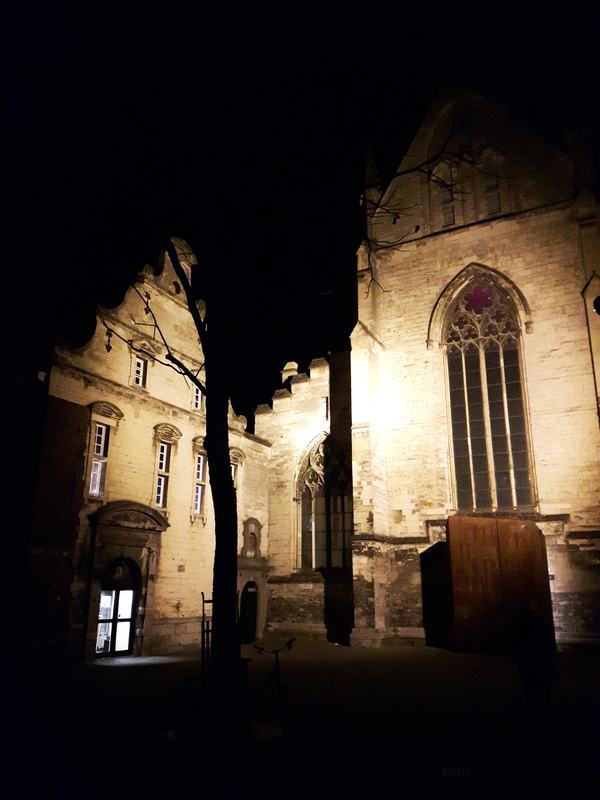 Here is my quick city guide to Maastricht! Maastricht, like most other cities in The Netherlands, is easily reached by train and takes just under three hours from Amsterdam Centraal Station, so it makes for an easy day trip, or a great little weekend getaway. I do suggest at least staying for a day, or two to fully appreciate all that Maastricht has to offer. 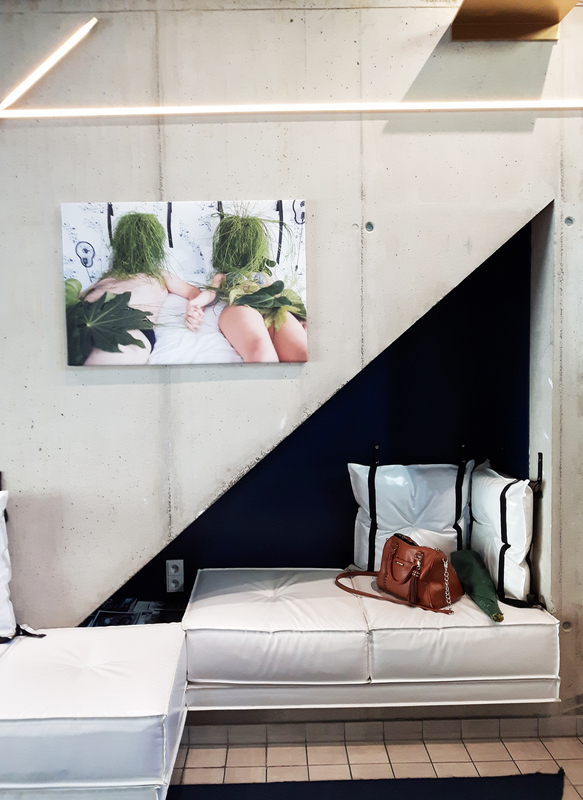 I chose to take the train from Utrecht, book a hotel and stay for two full days at the hip and trendy Kaboom! 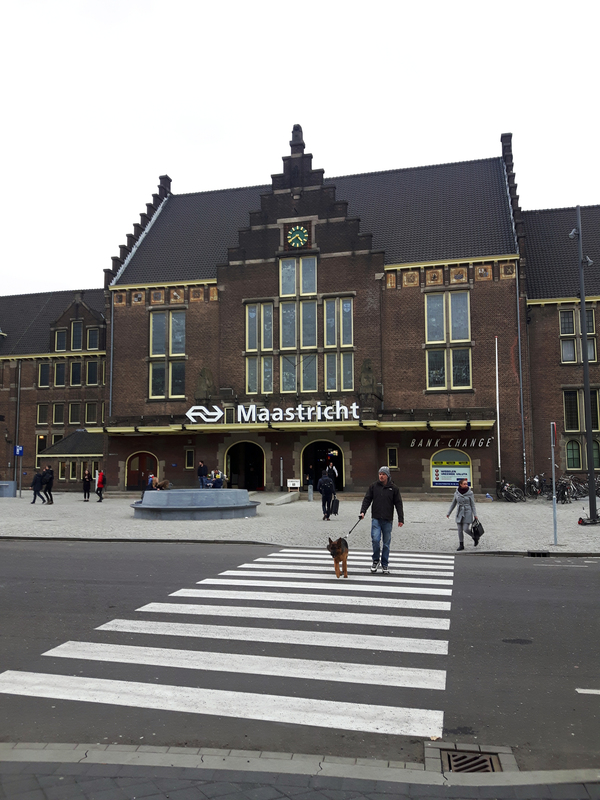 Hotel directly across from the Maastricht train station and bus terminals. This hotel was one of the coolest places I’ve stayed. 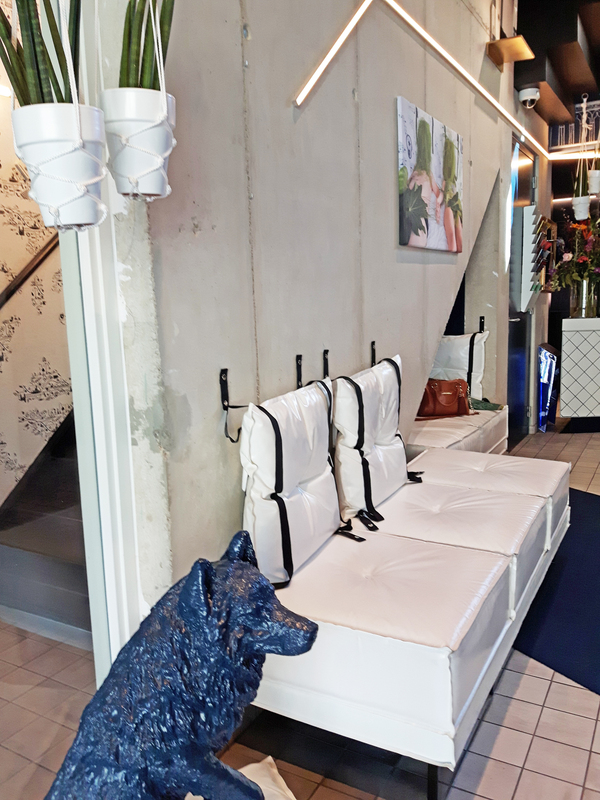 The rooms are bright white with quirky details and a fresh vibe. In fact, in 2015 they were voted as having the Best Hotel Concept. 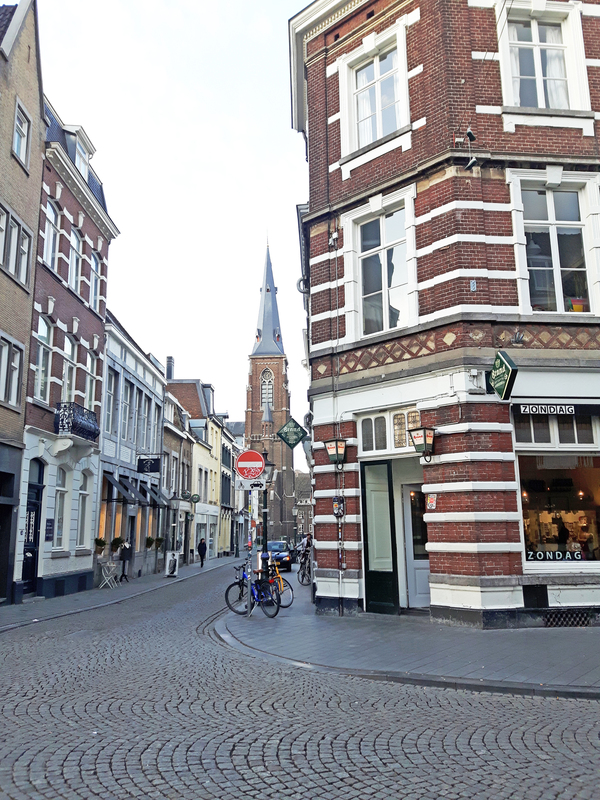 Once you arrive in Maastricht, you’ll find that it’s very easy to get around on foot and see all the main attractions, which are mainly situated within the Old Town. For all train fares and schedules, visit the Dutch Railway website for more info. Maastricht, like most Dutch cities, is easily explored by putting down the map and walking around. As soon as you step foot out of the train station, it feels like you’re in another country, as the surrounding architecture has more of a German style to it. From the train station, head straight out the front door and wander down Stationstraat and within ten minutes, you’ll be greeted by the impressive Sint Servaasbrug, which boasts sweeping views across the river Maas. The Sint Servaasbrug is the oldest pedestrian footbridge in The Netherlands and was constructed during the 13th century. The city centre is located just after the bridge where you’ll find a plethora of shops, restaurants, bakeries and people chatting and enjoying the outdoors, no matter the weather. 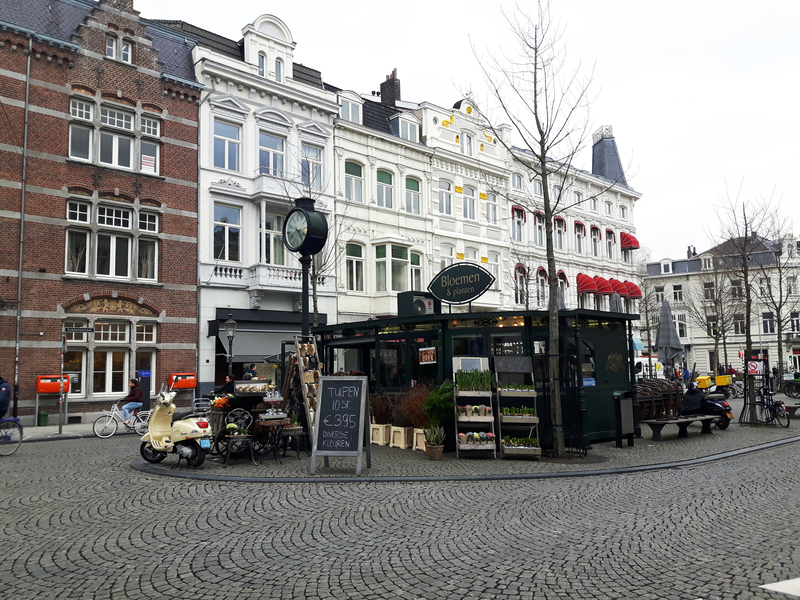 The Markt is one of two main squares within Maastricht where you’ll find the Stadhuis van Maastricht, which is the 17th century dark stone Town Hall that dominates the centre of the city. Bells chime off every hour and play a relaxed tune while you have a snack at one of the many surrounding restaurant patios. 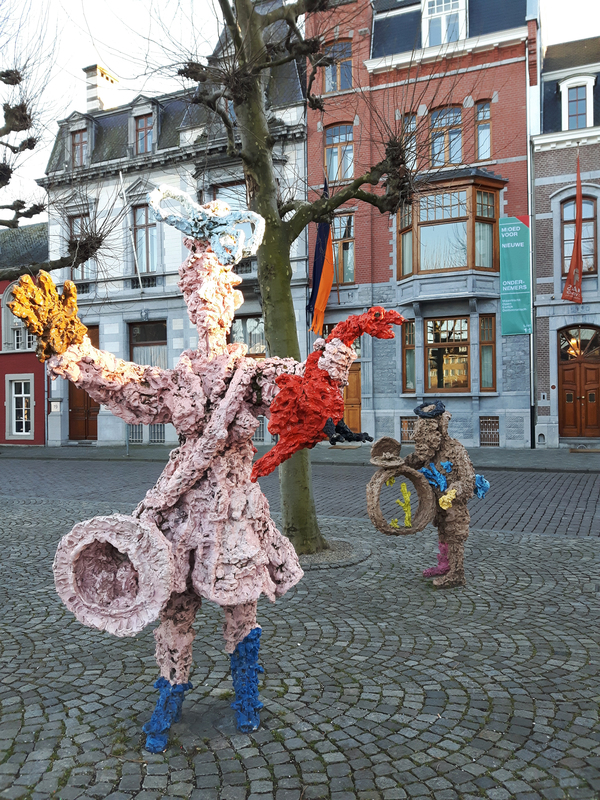 The second square within Maastricht is the Vrijthof, which has many outdoor markets and outdoor art installations. 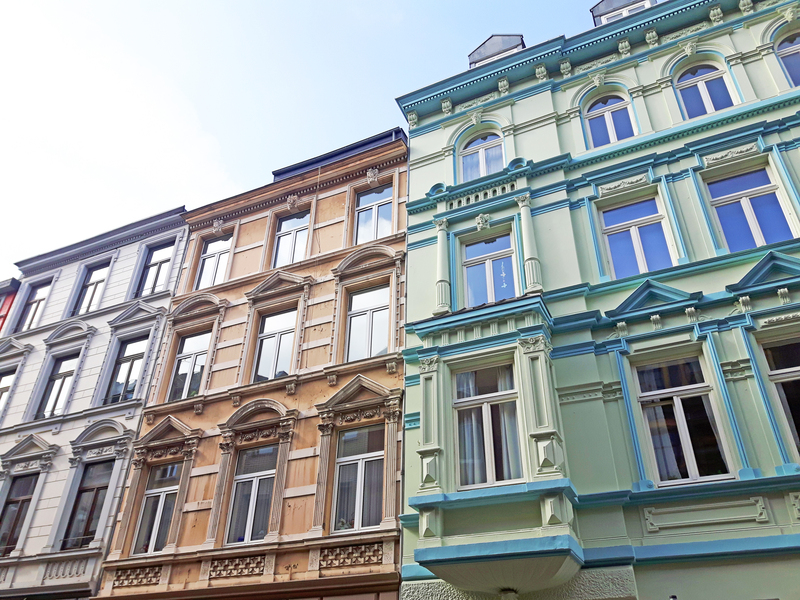 The Vrijthof is also home to the beautiful Roman Catholic churches of Saint Servatius and the ruby coloured Basilica of Our Lady of the Assumption, which adds a pop of colour to the scenic square. 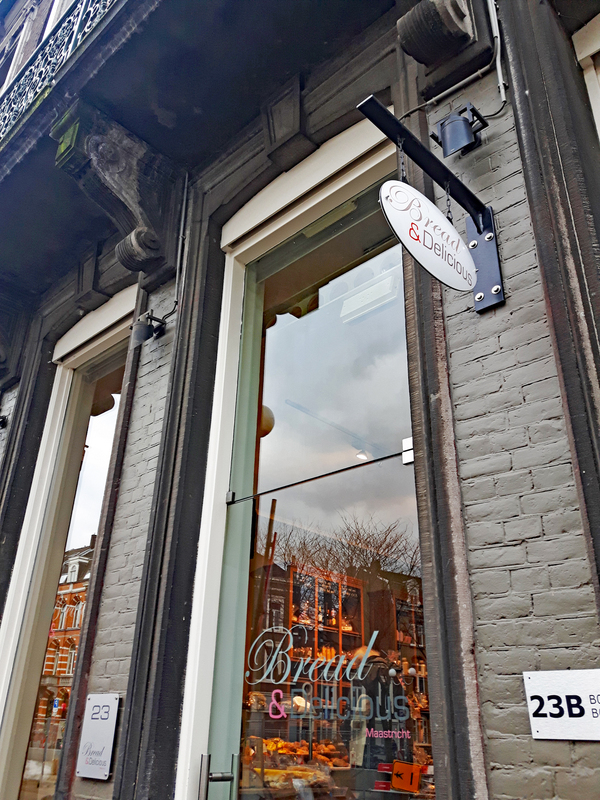 The city centre also has one of the world’s most beautiful bookstores located inside of a converted 13th century Dominican church called Boekhandel Dominicanen. There is also a cozy café tucked in the back of the bookstore where you can grab a coffee, a snack, or a book, sit back and relax all while enjoying the ambiance and architecture of the church’s grandiose interior. 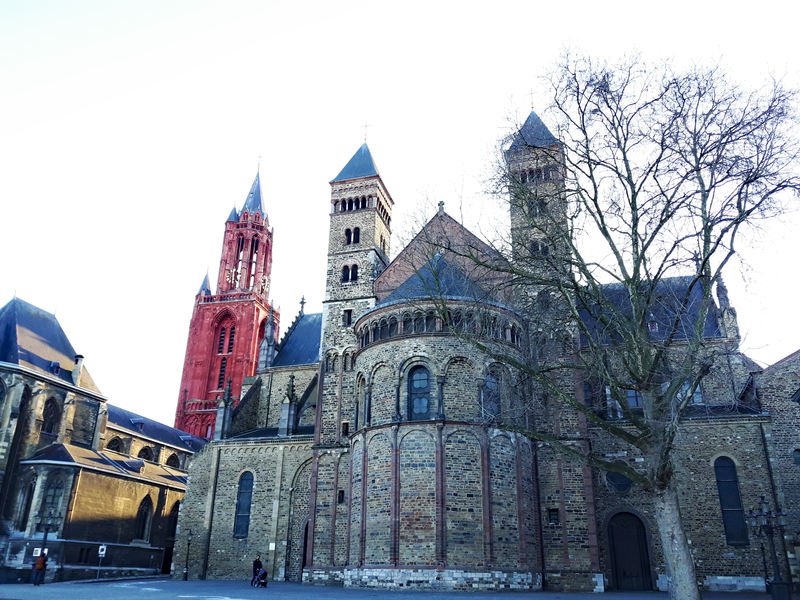 Knowing that I was a short distance away from Germany and feeling a strong desire to revisit the land of grand churches, pretzels and amazing beer, I decided to take a quick day trip over the border and into the medieval town of Aachen, which is situated about an hour’s bus ride away from Maastricht. 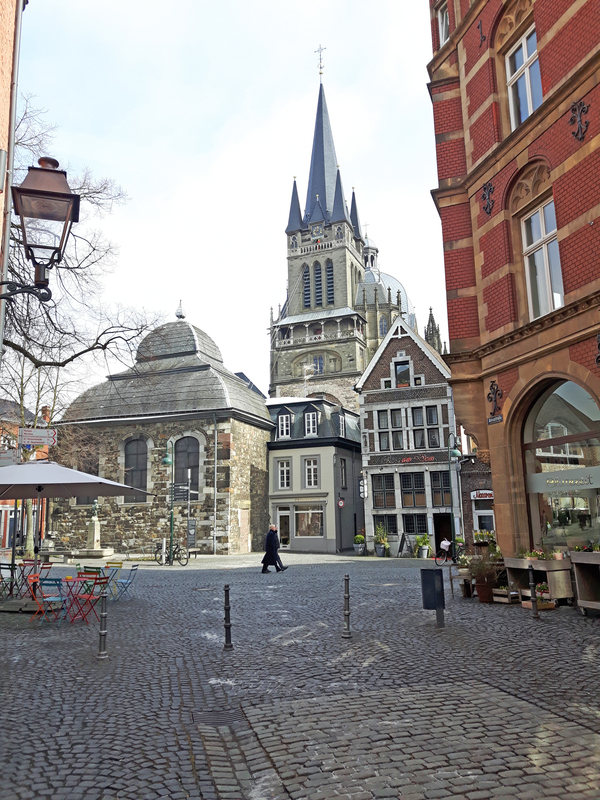 Aachen is a charming city that sits directly on the border with The Netherlands and Belgium, so a quick jaunt into the city is a must. 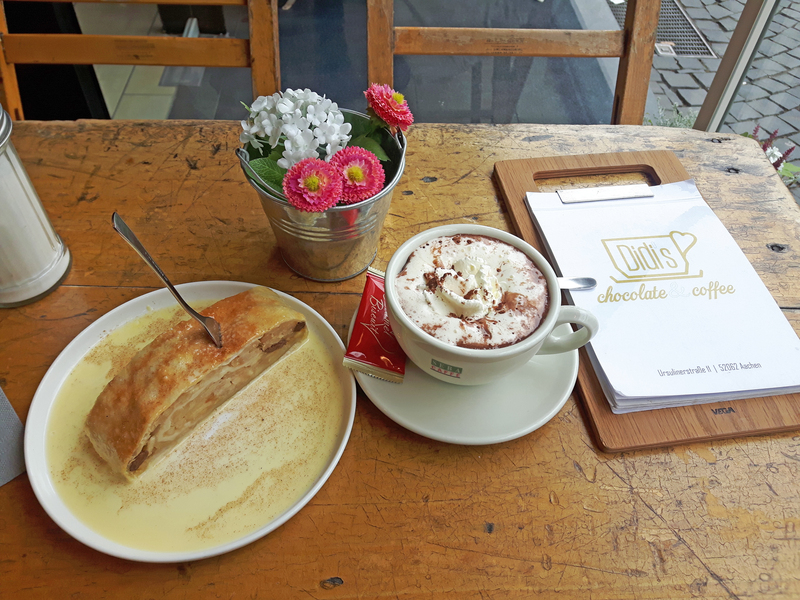 While visiting, don’t skimp out on experiencing some tasty homemade apple strudel and a big mug of hot chocolate as well as wandering the medieval city centre with the massive cathedral smack dab in the middle of the square. To get to Aachen, you’ll need to take the Arriva bus from Maastricht. 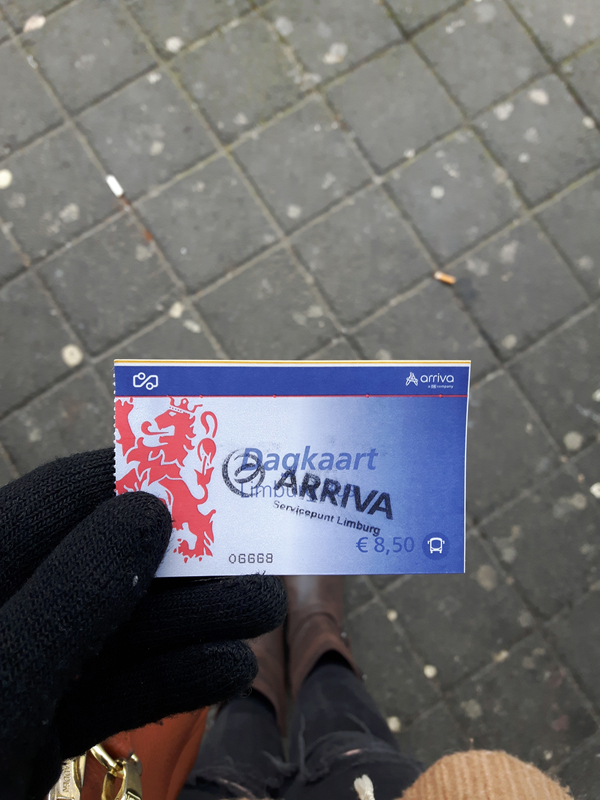 To purchase a return ticket, head into Masstricht’s train station and head to the Arriva counter where you can purchase your ticket for a low cost of €8.50. My train ride to work everyday (one way) literally costs more than that! The bus terminals are on the side of the train station and can’t be missed. At the time of my trip, the 350 bus was the one destined for Aachen and was at the “H” post. 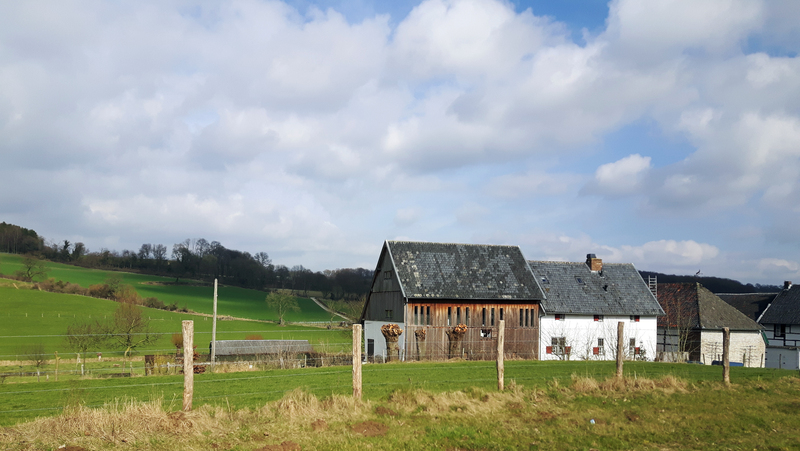 The drive to Aachen takes you through sprawling green pastures of the Dutch countryside and with rolling hills as far as the eye could see, you knew you were getting closer to Germany by the kilometre. 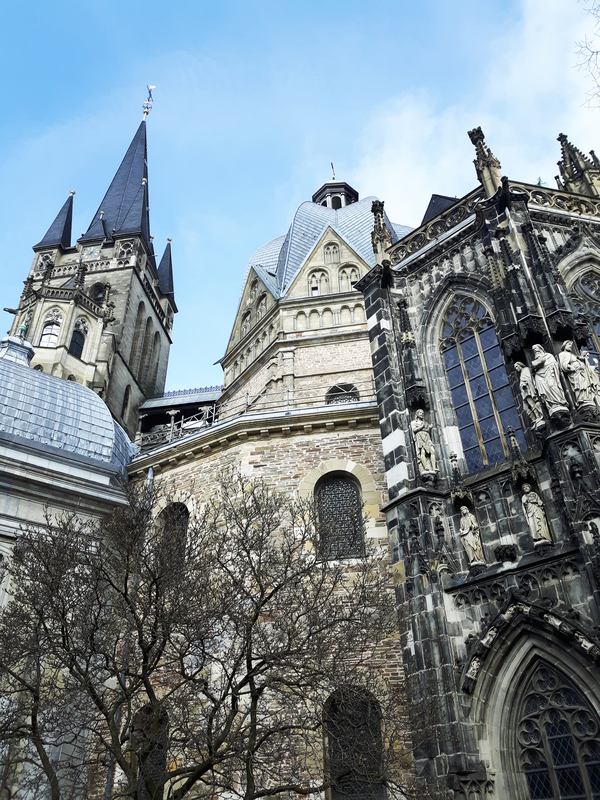 Before you know it, you’ll be in Aachen and ready to explore. Guten Tag! Maastricht is known as the gastronomic capital of The Netherlands. Being such an eclectic city itself, you can bet your dollar (or Euro) that you’ll be spoiled with an array of different cuisines to suit whatever you’re in the mood for. 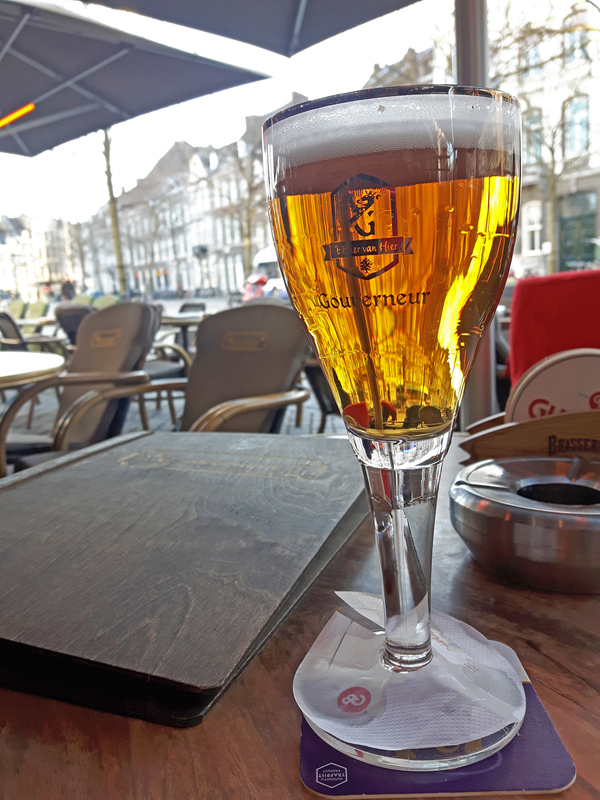 I’ve listed some of my favourites below, so be sure to look out for them if you’re ever in Maastricht. Sweet Treats – Do you like macarons? Do you especially like macarons when they are about half the cost of anywhere else in Europe? Well, if you’re like any red blooded dessert lover, then you’ll need to head on over to Bread & Delicious located at Stationsstraat 23. I first read about this bakery in a post from fellow travel blogger and macaron lover, Brooke from World of Wanderlust. When I messaged her to show her a photo of where I was, she was ecstatic and how could I blame her? The macarons here are deeeelicious!! This cute and cozy little bakery is just steps away from the train station and was conveniently located a stone’s throw away from my hotel. 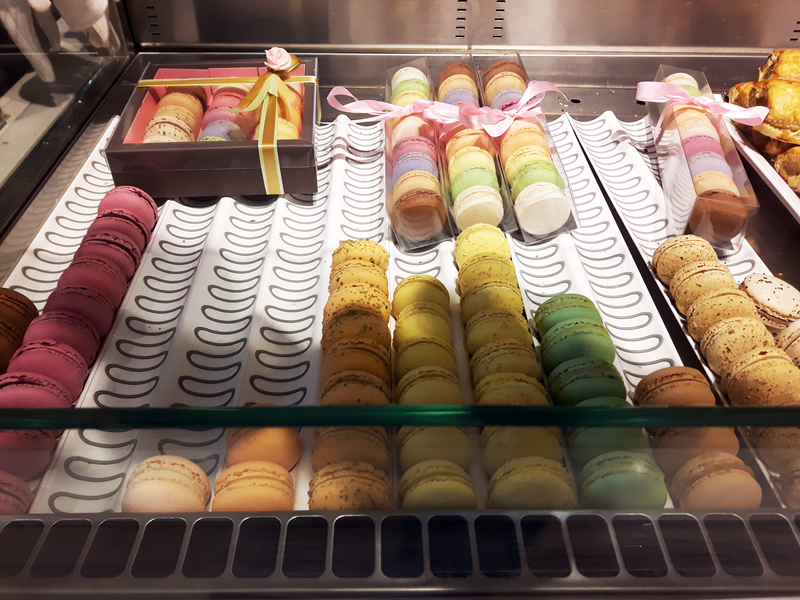 I may have visited twice during my trip, but once you taste those macarons, you’ll thank me. 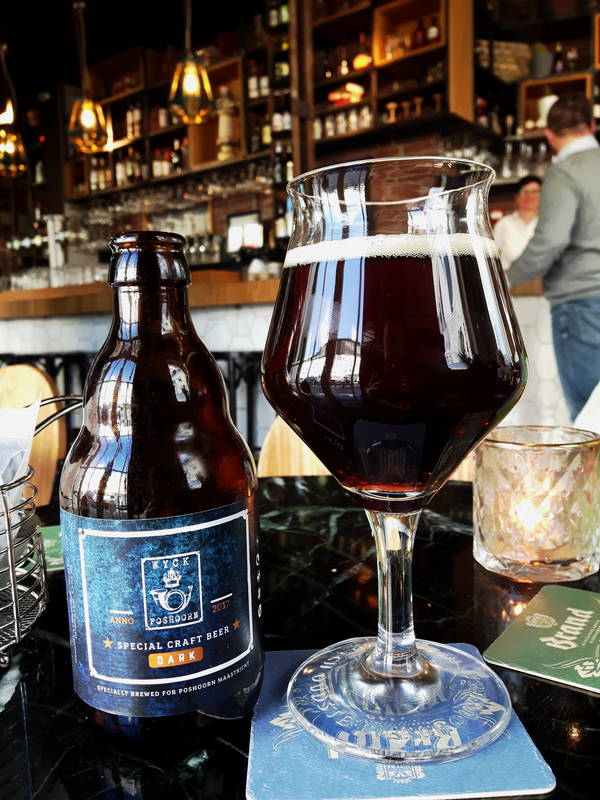 Beers, beers & more beers – If you’re looking for a place to chill out and grab a beer, or two, then head to De Poshoorn located at Stationsstraat 47. De Poshoorn also has modern and clean rooms upstairs to stay in. I arrived in Maastricht three hours before my check in time, so I had a bit of time to kill. I headed over to De Poshoorn and as soon as I walked in, I knew it would be a great place. The staff was friendly, the interior was wooden and cozy, the beer selection was massive and it was filled with locals. I was the only tourist in sight. I ordered a plate of Bitterballen, sat down, went over my map of Maastricht and people watched out the window. 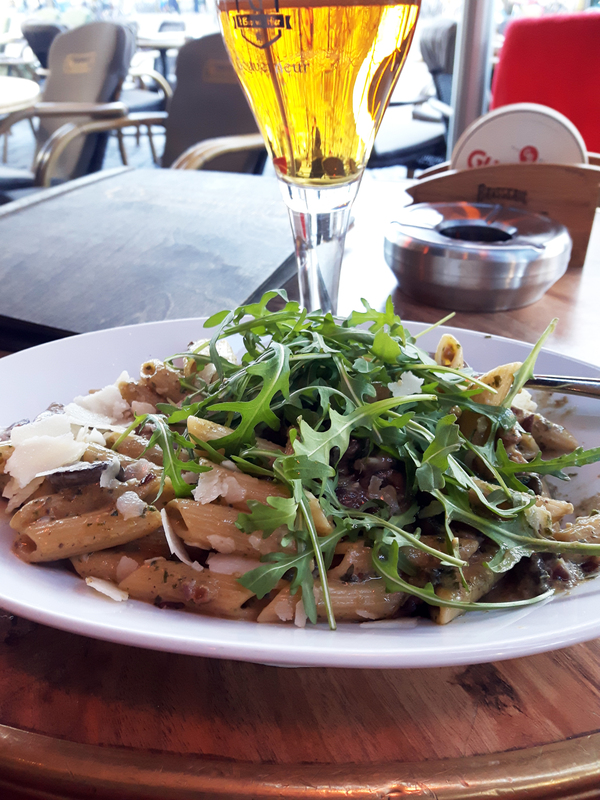 Patios & Pasta – I had the best pasta during my trip at De Gouverneur Maastricht Belgisch Speciaalbieren-café located at Boschstraat 105. So good, that I dreamt about it the rest of the trip. 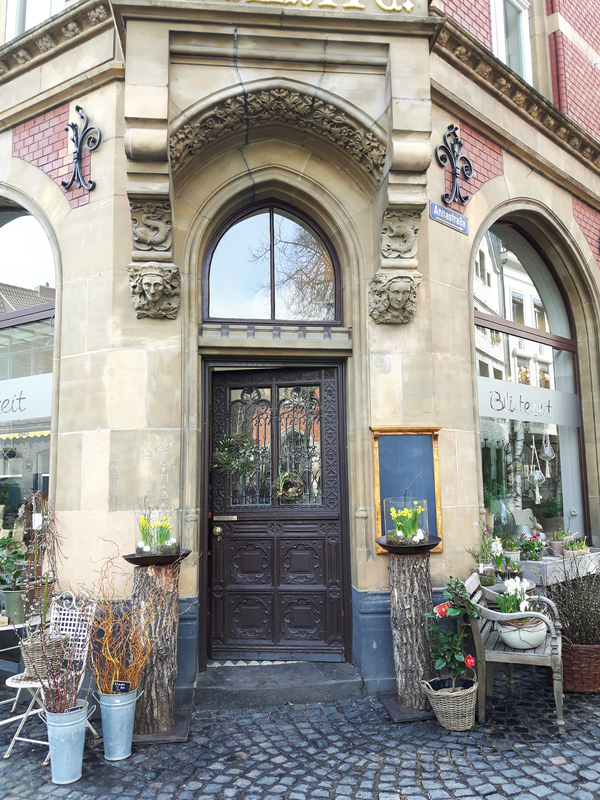 This Belgian restaurant is located just off of the Markt square and I highly recommend eating here. The beer selection is so large, that you may just have problems choosing what to get. The prices are reasonable, the patio is heated and has blankets flung over the chairs for those chilly afternoons and evenings and the portions are big and hearty. What more could you ask for?